Customers just can't quit Comcast, Wells Fargo, or Equifax. Companies that get a bad reputation from consumers often do so because they don't have to make their experience better to keep customers. Great examples of this are a cable company that operates as a monopoly in many areas, like Comcast (NASDAQ:CMCSA), or a bank you just can't get away from, like Wells Fargo (NYSE:WFC). Or even a company with all kinds of data about you that doesn't seem to manage that data carefully, like Equifax Inc. (NYSE:EFX). For one reason or another, these companies can get poor marks from consumers every year, yet we keep paying our bills and don't seem to have the ability to switch providers. It's the fact that consumers hate them, but still can't quit them, that makes these great dividend stocks. Comcast may take the most public ridicule of the companies on the list, in large part because its customer service has a bad reputation. But when you run a cable company that often has a near monopoly wherever it operates, there aren't a lot of choices for customers. 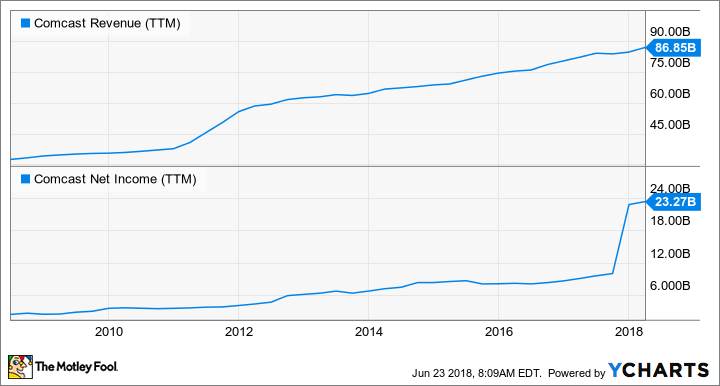 You can see below that a bad reputation hasn't hurt revenue or earnings growth over the past decade, and I wouldn't expect it to slow the company down now. CMCSA Revenue (TTM) data by YCharts. Comcast has also done a better job than most of its cable rivals in preparing for the end of cable TV. It bought NBCUniversal to expand its media empire and has leveraged that content to add theme parks to the mix, much like Disney has done to build its highly profitable business model. The growing cash flow has been used to return billions in cash to shareholders since 2009 in the form of a dividend. 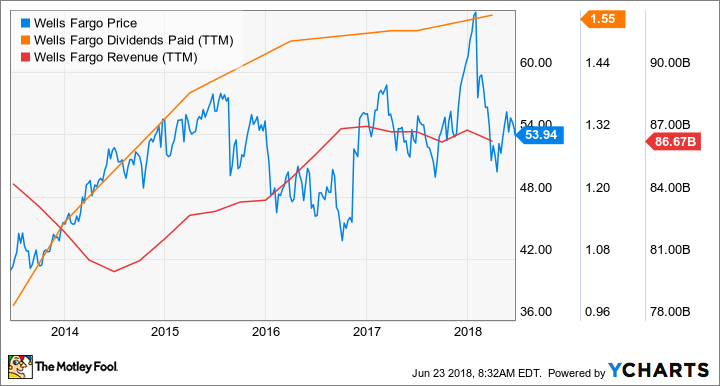 The payout is up from $0.14 per share to an expected $0.76 per share in 2018, while management expects to buy back $5 billion in shares this year, the fourth straight year it will buy back at least $5 billion in stock. Comcast may not be a popular company, but it's a great dividend stock for investors because customers can't seem to quit paying for its services. Fake accounts, worker retaliation claims, unwanted auto insurance, and accusations of unauthorized mortgage modifications are just scratching the surface of Wells Fargo's headaches in the past two years. Still, revenue hasn't been hurt, the stock has been steady, and the dividend has actually gone up over that time. The reason Wells Fargo hasn't been disrupted is that it's one of only a handful of big banks for customers to choose from. It's just hard to overturn a ship with $1.9 trillion in assets, 8,200 locations, 13,000 ATMs, and 265,000 employees. For me, it's the convenience of the ATMs just down the road that makes switching to a different bank very difficult. 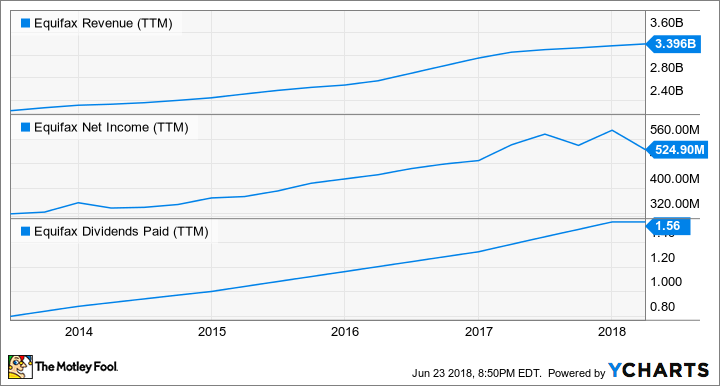 Wells Fargo's dividend isn't the biggest on the market, with just a 2.9% yield today, but it's shown the ability to grow its dividend long term. If customers aren't going to abandon the bank when it opens fake accounts, there doesn't seem to be anything it can do wrong and not continue to ring the cash register. When Equifax's data-breach saga began in 2017, the company was a powerful -- but unknown -- player to most consumers. The fact that as many as 150 million people had their data stolen from Equifax was as shocking as it was confusing, and the vast majority of consumers did very little to either check or protect that data for the future. Not surprisingly, Equifax hasn't done well in surveys of the most hated companies since then, but the data breach has done very little to the company's business. EFX Revenue (TTM) data by YCharts. Revenue growth hasn't stopped since the data breach, and in the first quarter of 2018 was up 4%. Net income has taken some one-time charges. But long term, the bottom line doesn't appear to be impacted by any cybersecurity-related loss of business. Not surprisingly, the dividend has continued to flow to investors and is actually up since the data breach was revealed. Equifax currently has a modest dividend with a yield of just 1.2% right now. But it's a dividend that should be safe from almost anything the market could throw at it. If a data breach that affected 150 million consumers couldn't bring Equifax down, what can? Despite the unpopularity of these companies, consumers keep paying them money, directly or indirectly, because they have little choice. If Comcast is the only option for internet or Wells Fargo is the only bank with an ATM nearby, it's almost impossible to choose another option. And Equifax has data on most of us without our even knowing it. These competitive moats may not make these companies popular, but they make for great businesses and consistent cash flows, which is why their dividends make them great buys today.